The Lakota People’s Law Project sent out a press release on Wednesday with a 15-page report detailing the unequal treatment of Native Americans under the United States criminal justice system. The report is comprised of key findings and proposed steps of action to alleviate issues such as extraneous violent crime against Natives and unfair police treatment. 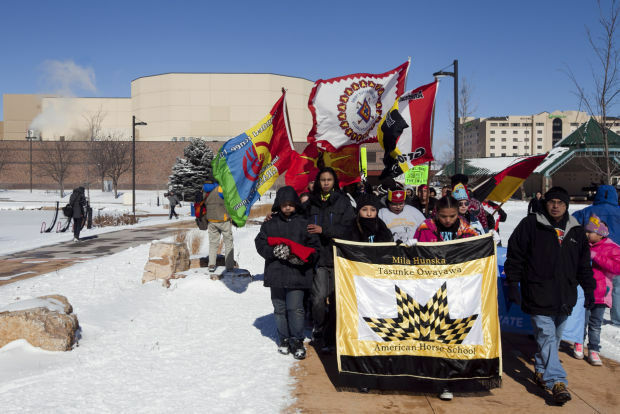 Following this important release, key players in the fight against such discrimination led a Native Lives Matter march in Rapid City, South Dakota which attracted 100 people. Facts show Native Americans are the racial group most likely to be killed by law enforcement or violently victimized by non-Natives in general. This vicious treatment starts young, with Natives making up 70% of the youth admitted into the federal bureau of prisons–a number entirely disproportionate to the mere 1% of our nation’s youth population constituted of Native Americans. South Dakota’s foster system continues to threaten steady upbringings and weaken ties to community and culture and this surely plays into issues such as substance abuse and crime on reservations. The Lakota People’s Law Project remains committed to the implementation of autonomous, tribe-run child and family service programs to ensure cultural preservation and limit instances of familial trauma within Native American communities. 70% of of jailed Native Americans convicted for violent crime claimed to have been drinking at the time of their offense. The establishment of tribe-run drug rehabilitation centers would greatly decrease the possibility of Native recidivism. Native mistreatment must be incorporated into the current societal discussion regarding injustices under the hands of law enforcement. It is due time for these problems to be addressed in order to reduce government expenditures and heal the broken relationship between Native Americans and the law enforcement purported to serve them. Further, an effort must be made to build up a police force fit to serve Native populations. While Natives account for 12% of Rapid City’s population, they hardly make a dent in the ranks of local law enforcement. There are just three Native police officers and no sworn deputies or corrections officers on the city’s team. According to KOTA News, progress is on the horizon. The force’s current hiring cycle is in full swing and they claim to be committed to diversifying. “We would welcome any Native American and any other cultural group to come and apply with us. Obviously we are looking for for the best qualified candidates we can hire,” said Rapid City Police Sgt. Andrew Becker. Becker’s department is taking a variety of measures in order to attract these indigenous applicants–collaborating with Native publications, recruiting through the United Tribes Technical College, and making an appearance at Pine Ridge High School’s annual career day. “Certainly it is ideal for any police organization to reflect the community that it serves,” stated police chief Karl Jegeris. This reflection is vital to a healthy relationship to a squad and the people it serves. A level of trust necessary for smooth operation is currently missing in areas such as Rapid City. The persistence of injustice in South Dakota is an ugly stain on the American fabric and until this country confronts its cruel treatment of indigenous peoples both past and present, it will remain unable to live up to the values of liberty and justice for all that it continues to espouse. WELCOME TO AMERICA!!! OH-YEA…you folks were here first, how do you get to be second-class citizens in your own country??? ALL I KNOW OF ONE of my great grand mothers is that she was Cherokee, and died in a mental institution. Trail of Tears and so much more that they will never talk about, cause it does not go along with their perfect little…AMERICA. BEING ON THE REDROAD, and the decisions that are made every day. We have to make that change, that those that are in so they think control. Will not give to those that are in need of it, just as Redcloud said, the only promise that they have kept…is when they promised to take our land. Do not think that all prejudice excludes poor whites. My daughter married into a family of business in a small town. When push came to shove in divorce court, over custody battle of the the sole child in the marriage, ALL documented papers by “social” workers and “court” appointed so-and-so’s favored the father over my daughter: like throwing the child from the fat into the fire, as he was not a good father or husband, having no interest in his family at all except to avoid paying alimony and child support. No authorities ever asked her family (us) what we knew in the matter. He gained custody. We are poor and white. (I am faintly (1700’s ) part Cherokee. I am Indian at heart. but a Christian first before all. I am Cherokee. However I have quite light skin. However, when in the 50s and 60s was treated like an animal. I was called names. And I remember my mother grabbing me up and running so they wouldn’t force me into a boarding school. The moment some people fimd out I am Cherokee, the attitude changes. On the other side of the coin, when natives find out I am one of them, they call me a “wanna be:. Either way I can’t win. Humans kill each other over the craziest things. Religion, color, language, what your grandfather did to mine. It’s all stupidity and ignorance. When will we grow up!